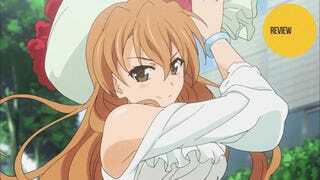 Back in November, I listed Golden Time as one of the ten anime of the fall you should be watching. Now, as the series passes its halfway point, I can truly say that Golden Time has a death grip on my heartstrings and refuses to let go. It’s rare that I come across a work of fiction—anime included—where I don’t dislike any of the characters, but Golden Time is certainly one of these. This is because the entire cast is full of normal, kind people just trying to make it through the day. More than that, there is no villain—no central antagonistic figure with which to draw our ire. Instead, the pitfalls of a normal social life prove to be more than enough conflict for the characters to handle. But just because they are generally good people doesn’t mean they are perfect or don’t make mistakes. Rather, all of them have serious flaws that they are working to overcome as they transition from child to adult. Banri, the main lead, is struggling to decide who he really is after the loss of his memories in an accident while Kaga, one of his romantic foils, is trying to let go of her controlling nature and obsessive need to plan everything out. In other words, the characters feel real and human. They are filled with multiple facets and glaring contradictions—just like all of us. All too often these days, two characters admitting they like each other is treated as the end of the romantic story, instead of what it really is: the beginning. Thus, a lot of popular fiction keeps any impending character romance in a perpetual holding pattern. Golden Time, however, does not fall into this all too common rut. Instead of an endless “will they, won’t they,” we see the characters date realistically. Characters break up and characters get together. The only real burning romantic question is who Banri will end up with in the end? And thanks to the series’ even pace, each episode leaves us feeling like we are consistently moving down the path to that answer. Anime romantic comedies tend to exist in a sort of hyper-reality where the rest of society—and the world in general—is routinely ignored for the sake of a laugh or a moment of dramatic posturing. Golden Time bucks this trend by keeping the story realistic and grounded (though with one glaring exception we’ll get to in a bit). The characters routinely have to deal with the consequences of a normal life—be that getting a cold, working a part-time job, or accidentally stealing a bicycle. This is not to say, however, that the series is without its comedic moments—far from it. Most of the real-world consequences of the characters’ (non-romantic) actions serve as unexpected punch lines. In this way, Golden Time is an anime guaranteed to get at least a few laughs out of you each episode. Is there any plot device more cliché than amnesia? I doubt it. But just because it is cliché doesn’t mean that it can’t be done right. Simply put, Banri’s amnesia is the central element that ties Golden Time together. On one hand, it facilitates the story’s love triangle—his new love versus his forgotten one. On the other, it is used to explore a universal question we all have when preparing to enter the real world: “Who am I and who do I want to become?” And watching him struggle with revelations from his past and his plans for the future is engrossing on a deeply personal level. As I mentioned above, much of what makes Golden Time so great is how it keeps itself grounded in reality while still being both comedic and dramatic. ...And then comes the sudden appearance of “Ghost Banri”—the soul containing all of Banri’s memories from before his amnesia. Not only does the existence of a ghost feel contrary to the established, realistic setting, but it also adds practically nothing to the series. Ghost Banri is just in the story to dish out exposition about Banri’s past and explain his past feelings. The problem is this: We don’t need someone to tell us how old Banri felt. Anime is a visual medium—we can be shown anything in his past via flashback. No framing device—i.e., Ghost Banri breaking the fourth wall and talking to us directly—is required. While he may have some greater purpose in the story’s back end, as it stands now, Ghost Banri serves as the single blemish on an otherwise excellent anime. As a rule, I don’t watch anime week-to-week—or any TV program for that matter. I prefer to watch them in multiple-episode chunks. But Golden Time is one of the few that I can’t wait to watch each week. Moreover, it is one from which I always come away feeling that something major has been either set up or resolved—thus leaving me satisfied that the story is progressing. If you want a good romance with realistic, light-hearted comedy, there are few better things to watch than Golden Time. Now all that’s left is to see if it can keep up this excellent quality as it moves steadily towards its conclusion. Golden Time airs on Tokyo MX in Japan. It can be watched for free and with English subtitles on Crunchyroll and Hulu.